It seems like rainy season is here. We have been experiencing a lot of rain lately. Mostly in late afternoon. While you are enjoying a cool night too, here is a recently completed necklace. 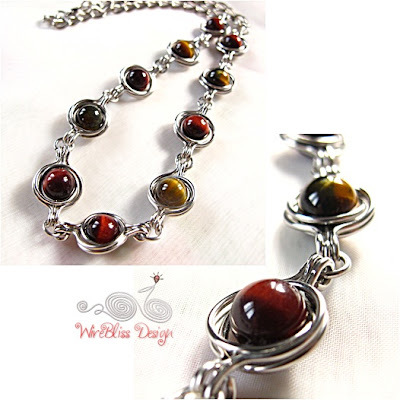 A Twice Around the World (TAW) wire wrap necklace. Stones are Tiger's Eye, red and golden. If you'd like to learn how to make the TAW component of this necklace, check out the tutorial here. Somehow, I am feeling very sleepy now. Signing off here, off to zzz land. That is beautiful Mei...wonderful colour combo, it could be worn with so many colours. Yeah, its end of the year and it will be cold over your side and wet over our side here.